Despite the wet weather, Los Angeles teachers gathered outside their schools early Monday morning to begin their strike against the nation’s second-largest school district. “The rain is not going to keep 35,000 teachers off the streets,” United Teachers Los Angeles Elementary Vice President Gloria Martinez said Saturday during a “tele-town hall” in which she and Josh Rutkoff, a parent with children at Aldama Elementary School in the Highland Park area of Los Angeles, answered questions from parents and reiterated the reasons for the strike. “This is a last resort for our teachers to bring about change,” Martinez said. At LaMotte Elementary School in South Los Angeles Monday, teachers huddled under canopies and waved their laminated signs at drivers honking their horns as they drove by. "It's not about salary. It's about having a nurse everyday in our school," Aida Trabanino, who teaches 2nd grade at the school, said in an interview. "Currently we have a nurse for two days a week, and students get sick every day or get hurt every day." Teachers at LaMotte Elementary check in with their union representative and try to stay dry. Meanwhile, National Education Association President Lily Eskelsen García joined UTLA President Alex Caputo-Pearl and a crowd of teachers, educators and others for a rally at John Marshall High School downtown. American Federation of Teachers President Randi Weingarten also tweeted that she was on the picket lines with teachers. Garcia and Weingarten also joined the protest as it continued at the Los Angeles Unified School District (LAUSD) headquarters, after demonstrators marched the 1.2 miles from City Hall. "Hey hey, ho, ho, Austin Beutner's got to go," the crowd chanted about the LAUSD superintendent. As teachers were marching, the district held a press conference. "We remain committed to resolve the contract negotiations as soon as possible," Beutner said. About 20,000 protesters participated in the downtown rally and about 3,500 showed up at schools this morning, according to the district. On Friday, UTLA turned down LAUSD's revised offer and accused Beutner of “bad-faith bargaining” because he didn’t attend two of the three negotiating sessions scheduled last week. Meanwhile, Beutner said during press conferences and in press releases that one reason why he did not attend bargaining was because he was in Sacramento, California’s capital, to seek more funding for public schools. The revised offer, dependent on the passage of Gov. Gavin Newsom’s budget plan, increases the number of additional educators that would be hired in the district from 1,000 to 1,200, allowing it to further limit class sizes, hire librarians and add an additional counselor for every comprehensive high school. The Los Angeles County Board of Supervisors is also expected to consider a motion Tuesday that would provide $10 million to the district, allowing for a school nurse at every elementary school. During UTLA press events, several speakers have talked about schools having a nurse one day a week. But UTLA's Caputo-Pearl and other union officials still say the district’s latest offer is insufficient because it would only provide those additional positions for a year and still includes a clause that would allow the district to override class-size limits. Before Friday's bargaining session, Caputo-Pearl also asked the district for an update on any efforts to expand community schools, plans to increase enrollment and Beutner's "reimagine schools" proposal, which Caputo-Pearl said he expects to be a "portfolio" plan, which refers to creating a citywide system of diverse school models from which parents can choose. It's unclear whether the district provided updates on any of those issues on Friday since bargaining ended when Beutner's press conference began. Teachers and community members march at Carver Middle School in South Los Angeles. During a Friday press conference, Caputo-Pearl also addressed uncertainty over how the district would respond to students who don’t attend school during the strike. “If there is any attempt to retaliate against a student that is absent during a strike, either because they want to support that strike … or for other reasons, we will be 100% at the back of those folks, fighting to make sure that retaliation doesn’t stand,” he said. On the call Saturday, Martinez and Rutkoff took questions from parents asking whether schools would consider students truant if they missed school due to the strike, or how missing days might affect graduation for a senior. Under California state law, more than three unexcused absences are considered truancy, but according to a California Department of Education official who responded to a parent’s question, the law also states that school administrators have discretion in determining whether an absence should be considered unexcused or not. Shannon Haber, a spokeswoman for LAUSD, also told the Los Angeles Times that students’ records would not be affected if parents don’t send their children to school while teachers are striking. The district on Sunday also tweeted a link to a "family resource guide," encouraging parents to send their children to school. Most parents with young children, however, did not have a choice whether to send their children to school. Late Sunday, the district tweeted that early childhood centers would only be open for preschoolers with special needs, and that the district's almost 100 California State Preschool classrooms would not be open at all. Becky Cunningham, who has a 2nd-grader at Playa Vista Elementary School on the west side of the city and a 6th-grader at the Katherine Johnson STEM Academy — a LAUSD demonstration school created in partnership with Loyola Marymount University — understands the tough choices that some parents would be making on Monday and for how ever many days the strike lasts. “Even with relatively good kids, 37 is a beast,” she said, during an interview, about the size of her older child’s class. To show support for the teachers, she planned to keep her 2nd-grader out of school and participate in a parent co-op in which parents share the task of planning educational activities for area children. But calling herself “a hybrid,” she also planned to volunteer at the STEM middle school on Monday because she recognizes that many parents across the city won’t have the flexibility to keep their children out of school. In the Florence Graham neighborhood, south of downtown, Diana Mendiola said she was planning to take her daughter Devanie Alviter, a 5th-grader at Wisdom Elementary, to school as usual — and to also ask who would be providing instruction and what her daughter's day would be like. "She's very stressed in her own way," Mendiola said in an interview. "If I don't like what I'm seeing, I'll take her back and teach her myself." Mendiola also works as a leader with Parent Revolution, a choice-focused nonprofit that works to help parents find information and navigate their way through LAUSD. "I hope whatever they do is for the best of the students," she said. Across the city Monday, public libraries, recreation centers, museums and the zoo were also offering space, learning materials and activities for students not attending school. Meanwhile, other unions as well as faith community and civil rights leaders were showing support for the striking teachers in rallies and on social media. “L.A. is at the ground zero of a fight, a national fight of who’s going to run public education,” Rev. William D. Smart, a member of the Southern Christian Leadership Conference of Southern California's executive board, said during a rally Friday afternoon. Rev. William D. Smart of the Southern Christian Leadership Conference of Southern California addressed attendees at a Friday rally. 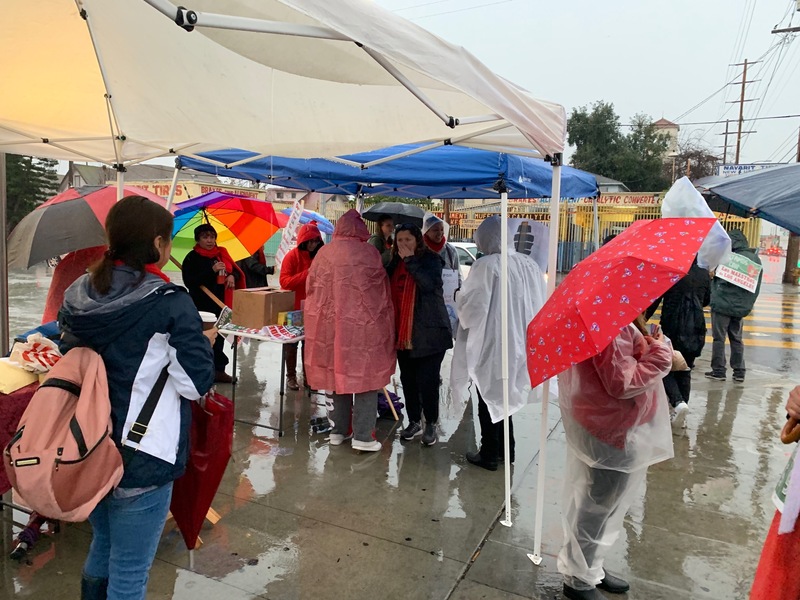 The strike was originally scheduled for last Thursday, Jan. 10, but UTLA delayed it in order to wait for a judge to rule on the district’s request for a temporary restraining order. On Thursday, a judge ruled that the strike could proceed.